Click for a clearer picture. Hello and Welcome to another Stamp Review Crew Blog Hop! This week's featured stamp set is: Balloon Celebration, Photopolymer Stamp Set! LOVE it! If you're already hopping, then you've just come from the Talented Yapha Mason's Blog. If your just joining me, No Problem! Start here and follow the buttons below! 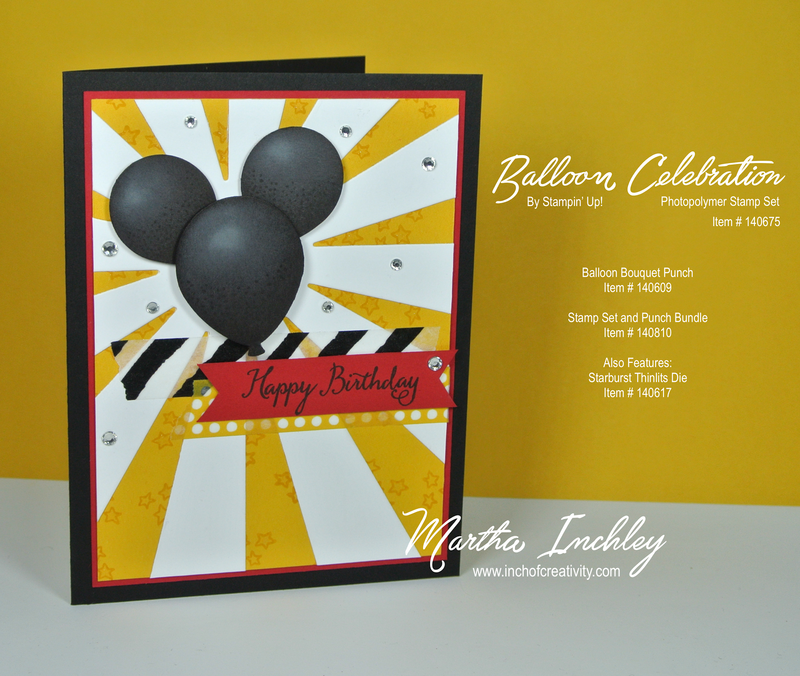 So, as you can see, I made a Mickey Mouse Birthday card! What do you think? Does it work? I used the Balloon Bouquet Punch (which coordinates with the stamp set) and punched out Basic Gray Balloons. 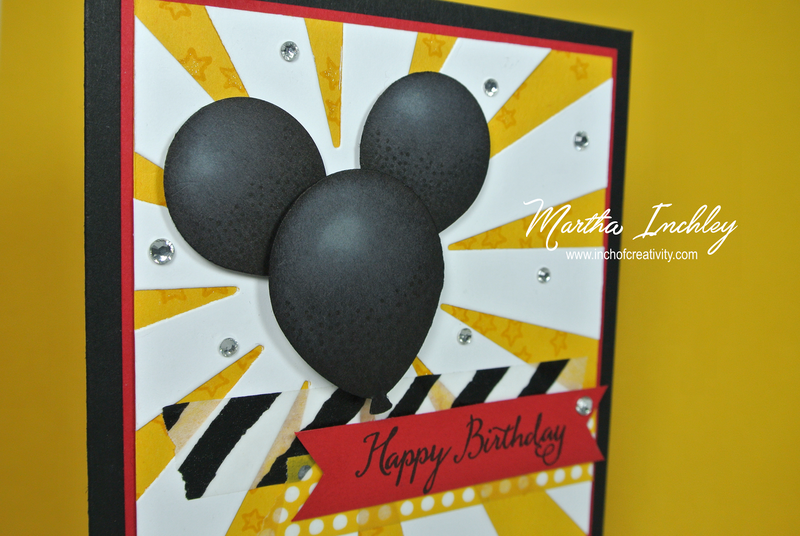 I then stamped the "dots" image and sponge daubed the balloons with Basic Black Ink. I left a tiny amount of Basic Gray cardstock showing as a highlight spot. This gives my balloons a very 3 dimensional look. For the background I used the Sunburst Thinlits Die. I just got this die and I love it! It's a lot of fun to create with. I mounted the sunburst onto Crushed Curry cardstock, which I stamped stars in Crushed Curry ink and coloured them in with my Clear Wink of Stella Glitter Brush. I then added a strip of washi tape from the It's My Party and Everyday Chic Washi Tape Bundles, and added my greeting. To finish it off, I added a few Bling, Bling, Rhinestones! Well, that's it for me, up next is the Talented Shana Gaff's Blog! Enjoy the rest of the hop! Happy Creating! Wow, I didn't even realize those were the balloons at first - very, very clever! I love this!!! Your Mickey head is perfect and I love the starburst behind it! Makes me smile! Adore your Mickey Mouse design! This is the 1st time I've seen anything done with rays die and stamp set I liked. Thank you so much for showing me another use for this, I wasn't going to buy it, now I will! My husband works for the mouse! He loves his job! I love what you did on your project. Again, Thank you! wow Martha - this is AMAAAZING! I am going to case this for my sister - she is a huge disney girl - goes once a year! Love how you sponged the balloons too - amazing! I love everything about your card! How creative! Love the Starburst and the bright colors. Fantastic card!